There’s an enormous mound of bricks in the small dusty town of Mingun about an hour’s boat ride from Mandalay. It’s an unfinished stupa, the Mantara Gyi Pagoda, built by King Bodawpaya’s prisoners-of-war and slaves way back in the late 1790’s to house a tooth from the Buddha that he’d been given by the then Emperor of China along with three of the Emperor’s daughters as wives. Apparently he liked the tooth the best. 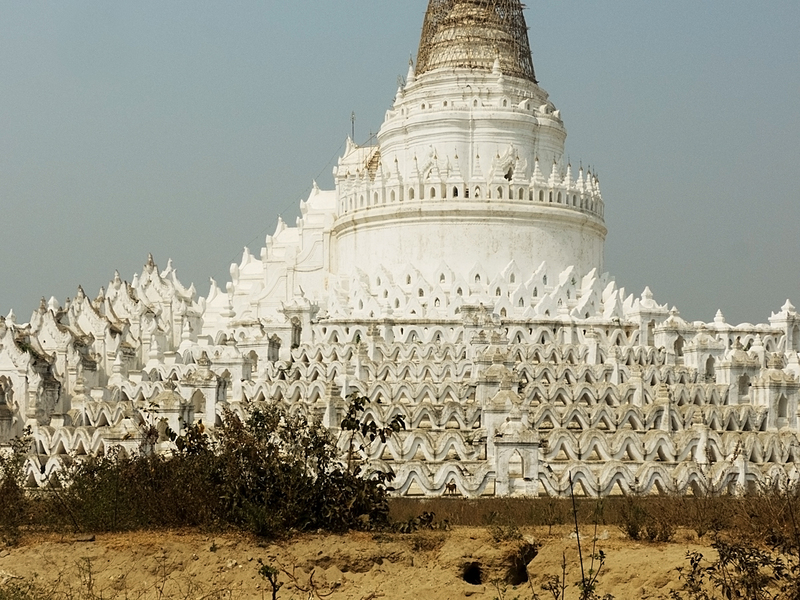 Anyway this King Bodawpaya, being something of a megalomaniac, apparently thought he was going to be the next Buddha, and decided that to house such an extraordinary and precious relic he would build the biggest pagoda the world had ever seen. It’s 72 metres wide and was supposed to be 152 metres high when finished. His slaves worked on it for about 30 years while he went off to live on some island in the river until he died. 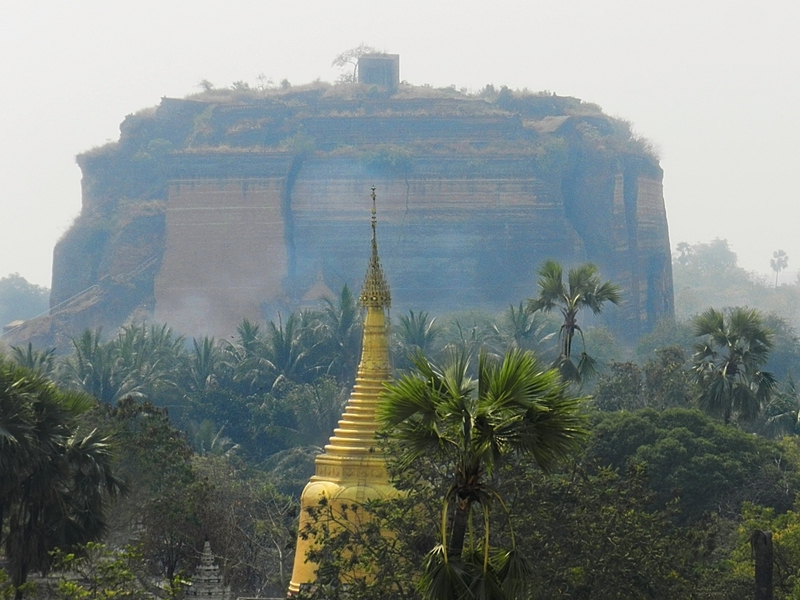 Not surprisingly there was not much happiness in the land and the rumour/curse/prophesy went around that as soon as the pagoda was finished the country would be in ruin. It pretty much happened that way apparently and when Bodawpaya died none of his relatives seemed interested in continuing with the project. 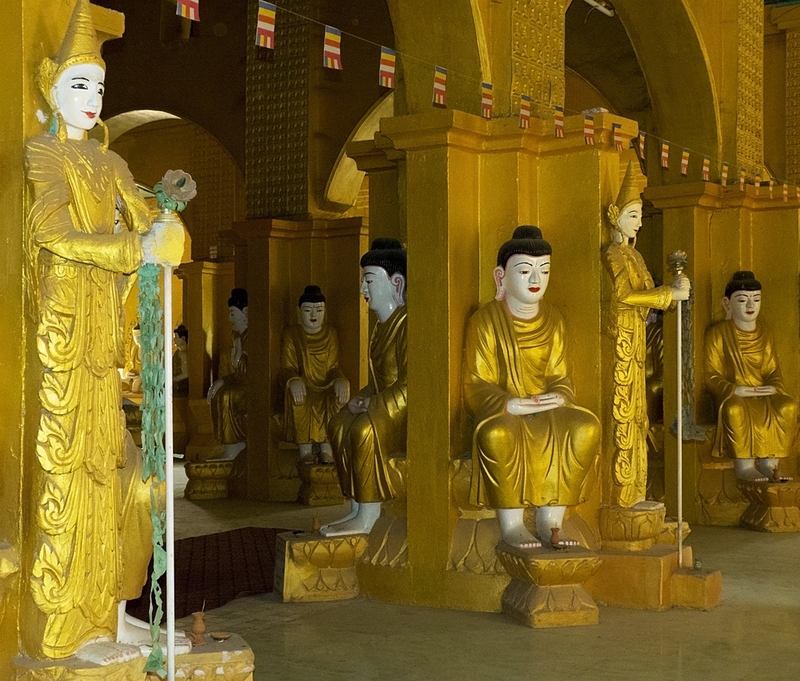 But here’s a little side bit of information – when the pagoda’s shrine room was complete Bodawpaya filled it with all the treasures he could get his hands on – gold, silver, artifacts of all kinds, and, best of all, a just invented English soda-water machine. I guess he thought that was a pretty special toy. The room was sealed. I can’t seem to find any information on what happened to all that loot. Maybe it’s still there in the middle of the colossal mound of bricks. Or maybe his relatives just helped themselves after he died. God knows he left enough of them behind. Apparently he had a staggering 122 children, and an even more staggering 208 grandchildren. He was a very busy man. And perhaps just a bit insane. Twenty years after his death the massive structure, 72 metres wide and 50 metres high, was cracked by an earthquake. Until 2012 you could still climb it, but then another earthquake damaged it even more so it’s unsafe to climb now. 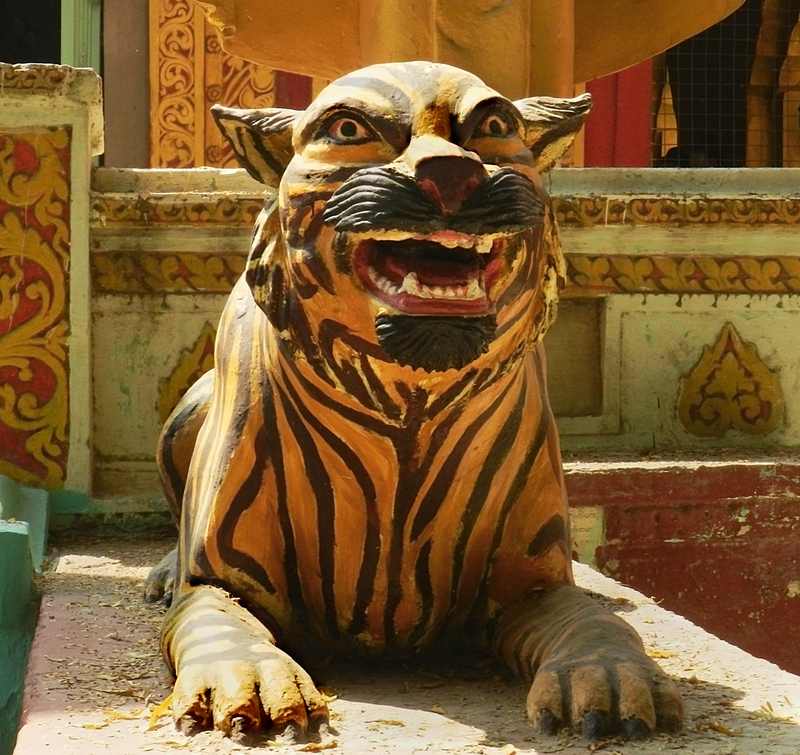 There is still a small cave like entrance used to this day as a place of worship, and there is still a wide white staircase flanked by many fantastical creatures leading from the unfinished stupa, past a “working model” of the pagoda, down to the river and guarded at the bottom two enormous “lions”. 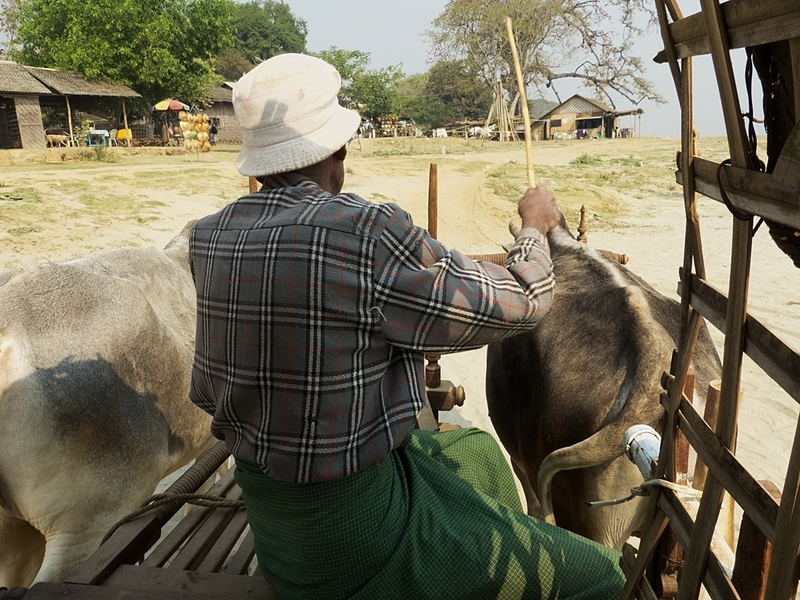 When we got off the boat from Mandalay the first thing we did was hire ourselves some local transport to visit all the sights. Maybe we could have walked, but who can resist a ride in a bullock dray? We hadn’t got very far when suddenly this man, astride his pile of lumber was coming at us. It was touch and go there for a while. Seriously the way those guys could manoeuver their vehicles with such style and panache was impressive. 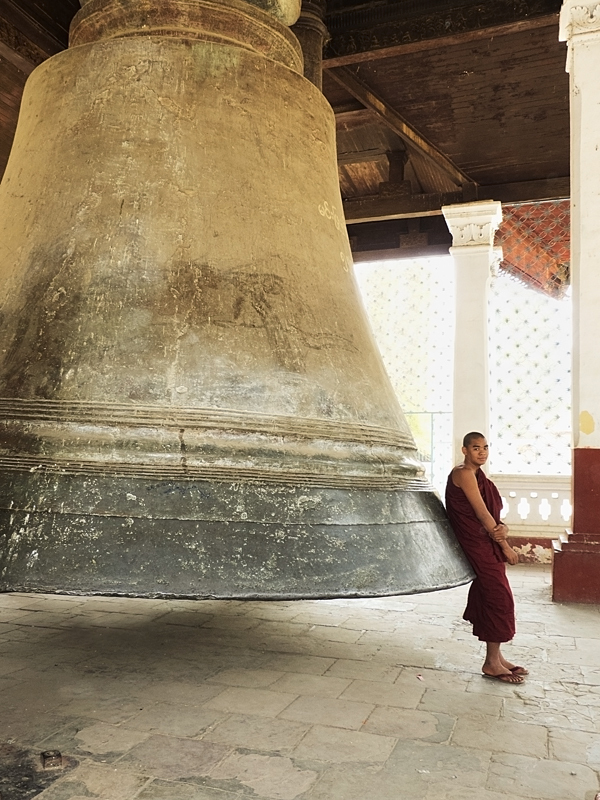 Another example of Bodawpaya’s megalomania is the Mingun Bell, the largest working bell in the world. It was cast in bronze in 1808, and weighs 90 metric tons. I’m sure I don’t understand the difference between a regular ton, and a metric ton, and neither do I wish to, but I gather 90 of them is really really heavy. And big. Bodawpaya was very powerful and I think it went to his head. He had the master craftsman killed to make sure he never again made anything as big. 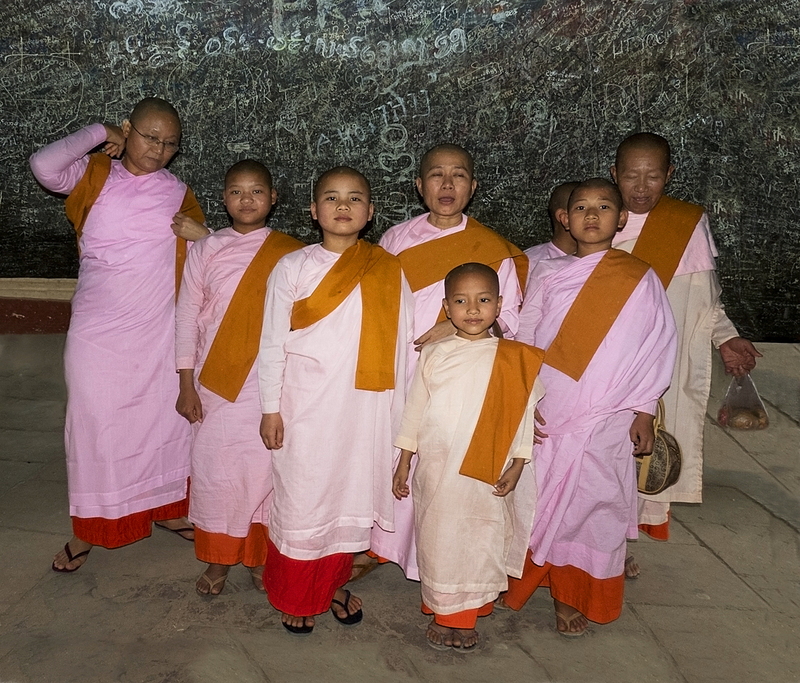 Like everyone else, international and Burmese tourists alike, we crawled under and inside the bell, where this group of visiting nuns, who happened to be there, obligingly posed for a photograph. 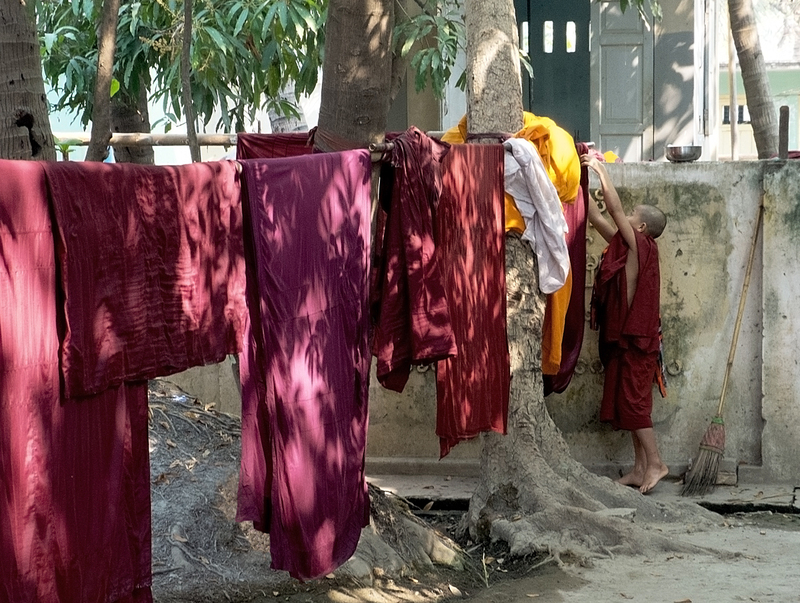 All over Indochina nuns and monks are highly respected, and revered, and at the same time are very much part of the ordinary daily landscape. To westerners they are quite exotic so we want to photograph them, and they oblige by posing nicely. 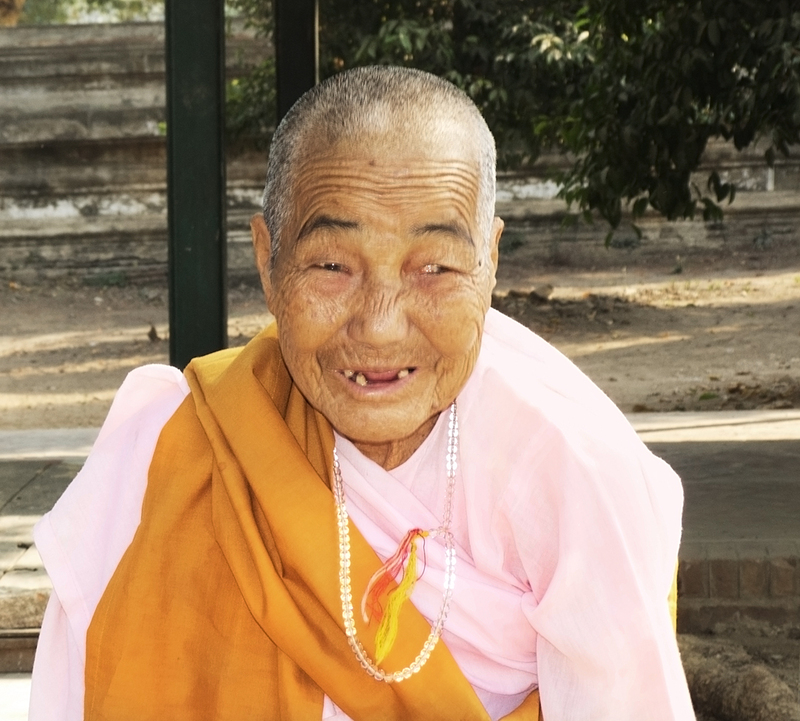 Every time I’ve asked to photograph a nun or monk they immediately become serious and stiff, and yet my experience of them is not like that at all. We kept running into this group of nuns at all the different sites in Mingun all day, and each time greeting each other with mingelaba, mingelaba, and big smiles, until by the third or forth time we were all laughing about running into each other yet again. Of course it’s a different story if they don’t know they’re being photographed, or if they’re a group of irrepressible young novices. 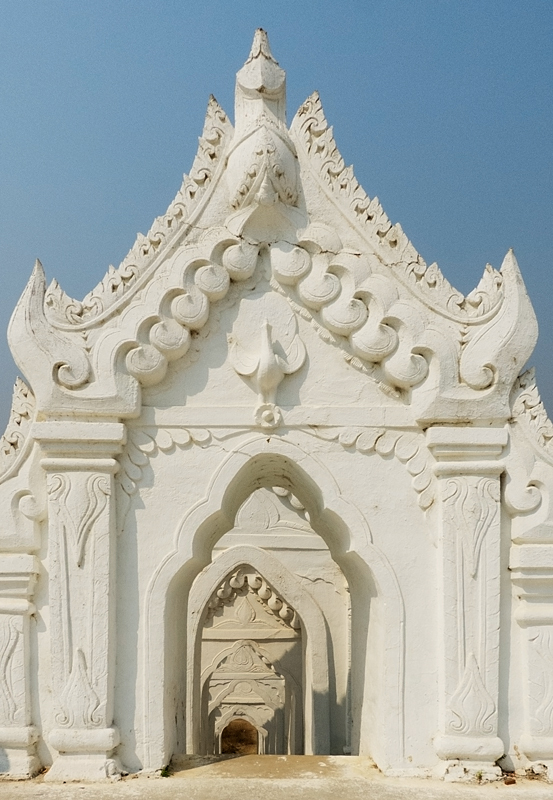 Bodawpaya’s successor, one of his many grandsons, had the Hsinbyume Pagoda built in 1816 dedicated to his first consort, Princess Hsinbyume, The Lady of the White Elephant, who died in childbirth, and who was also Bodawpaya’s granddaughter. Go figure. 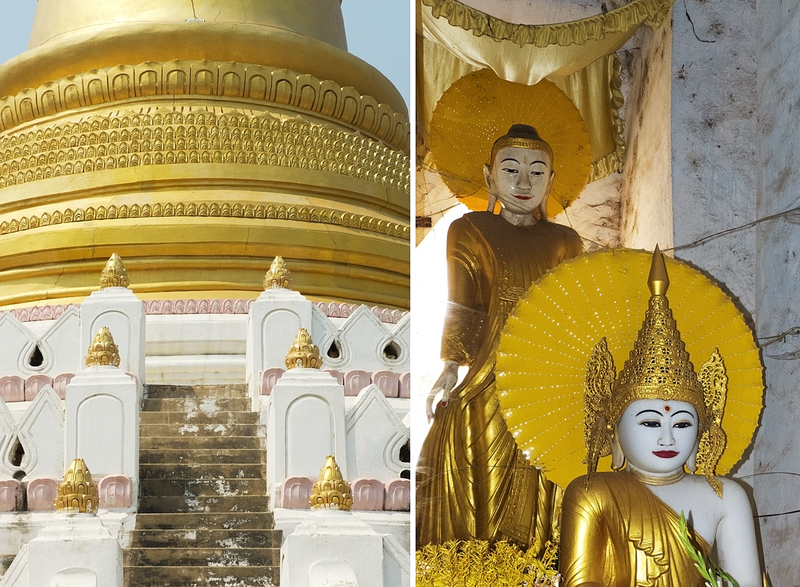 It’s a building with many entrances via covered staircases, many levels to explore, many niches for Buddha and Nat (nature spirit) statues for worship, and fabulous views from the top. 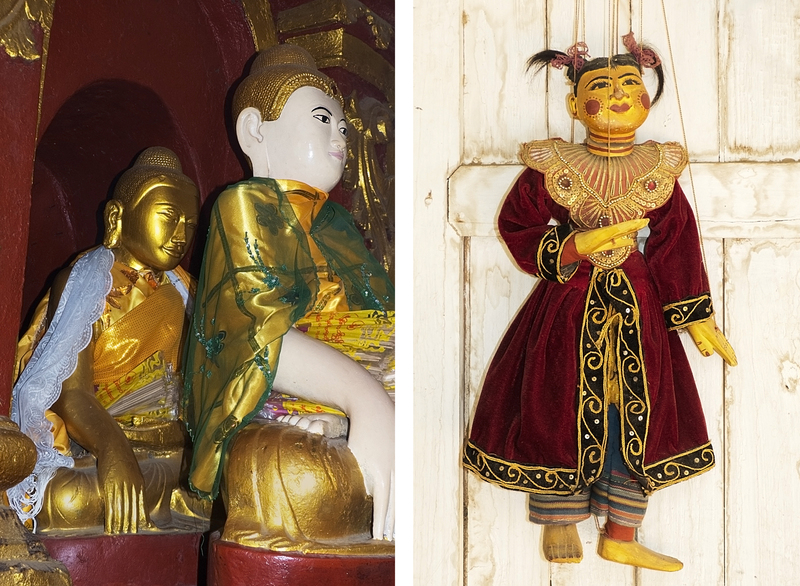 Which leads me to marionettes – they are a long and respected story-telling tradition in Burma, and we went to several shows in both Mandalay and Bagan. We found these beautiful marionattes for sale in Mingun. 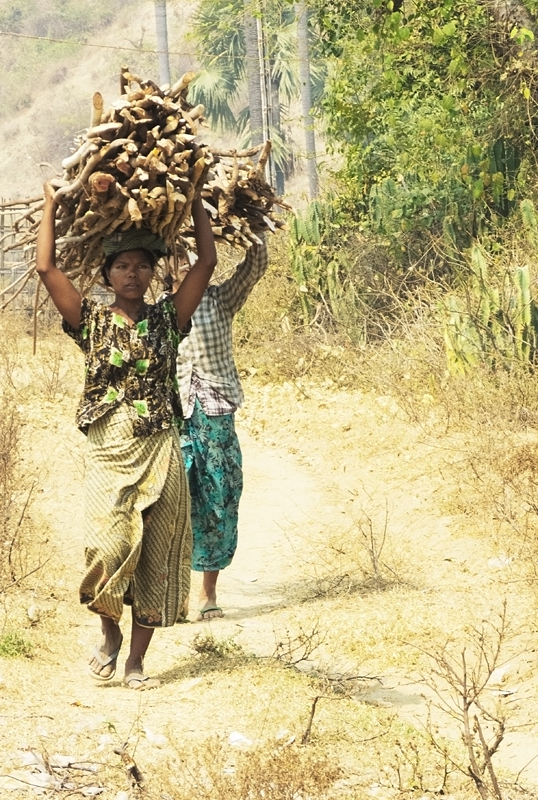 And a couple of shots of the reality of daily life in a small town in Burma – women bringing in the wood supply, and some others having an ice cream break. 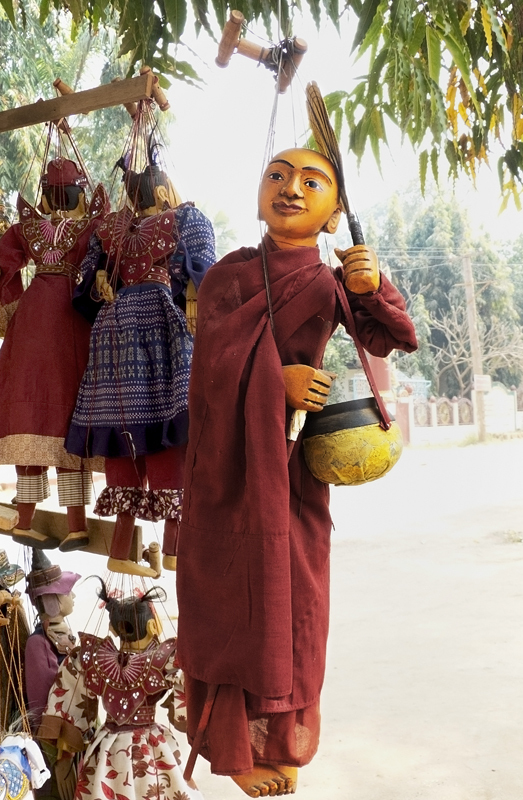 For about a hundred years, beginning about the mid 1700’s, a whole bunch of kings, including the two mentioned above, moved the capital of their country around from Amarapura to Inwa, back to Amarapura, and then to Mandalay. They’re all quite close together, as is Mingun just up the river. 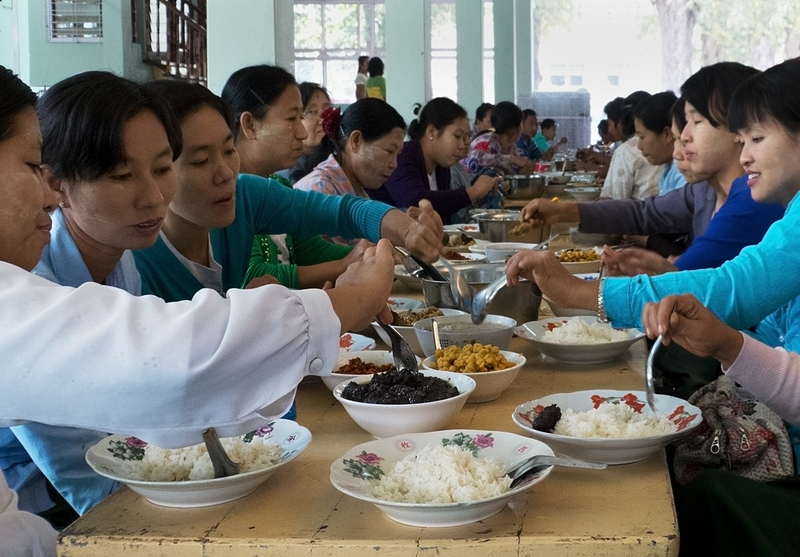 It’s a tradition that’s still continuing apparently as the current government moved the capital from Yangon to Naypyidaw about five years ago; probably to be away from the prying eyes of the big city. 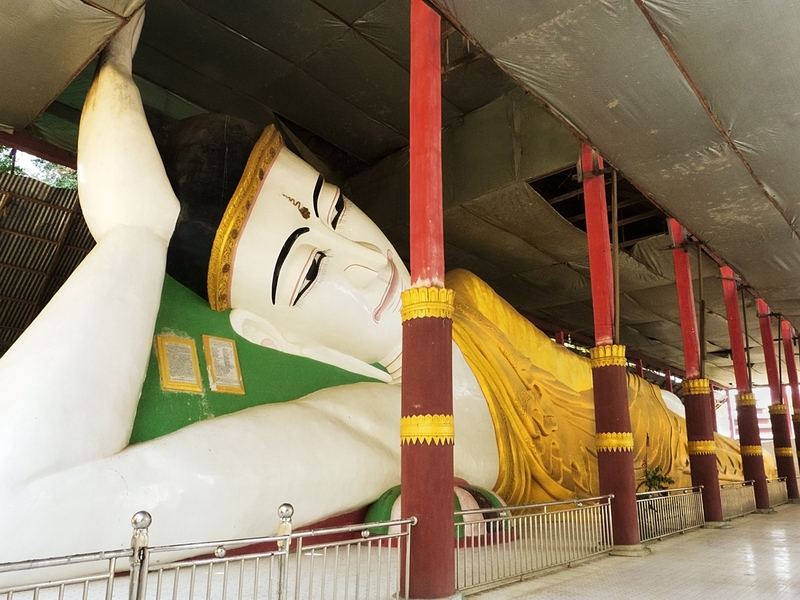 Amarapura was founded by Bodawpaya, the same nutty guy who had his bell-maker executed. The large, and famous, Mahagandayon Monastery is located there. It was a special visit for us for a couple of reasons. As we entered, our first encounter was with this nun who was sweeping the courtyard. We stopped to say hello and with the help of our driver discovered she was 92 years old. She also said something about my life, some kind of recognition of the future or prophesy. I didn’t get the exact words but I know it was positive. It’s as if she saw something in me, and I in her. There was an immediate connection between us and I’m still moved when I look at her picture. 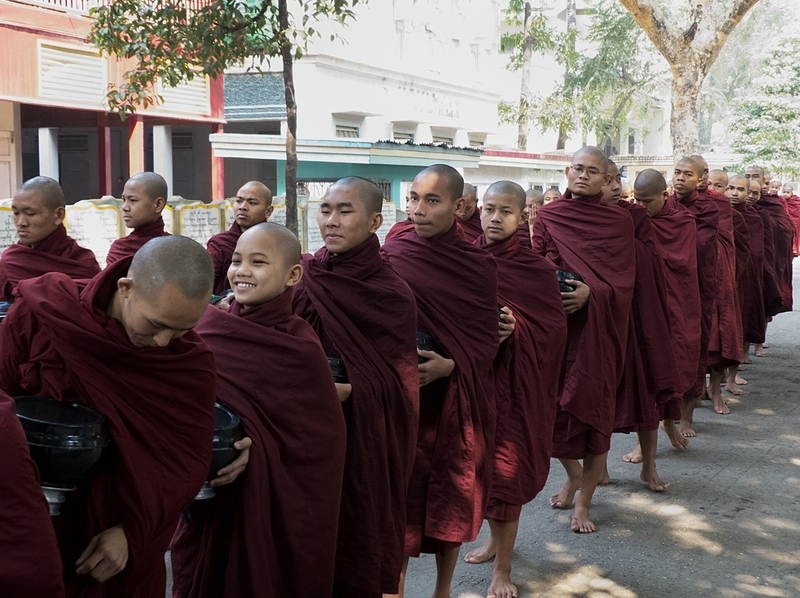 We were taken to the temple as part of the usual tourist round to watch the monks line up for their morning meal. Many many of them, so patient, so quiet, so stoic. As we wandered around the monastery we came upon the most amazing thing. Serendipity had arrived again. 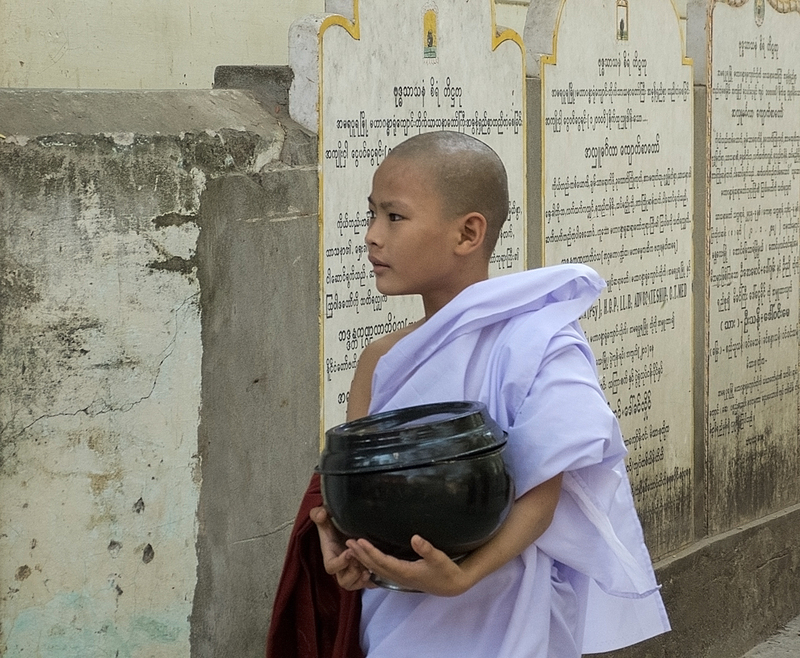 There was a special family celebration happening to send some young boys off to become monks. 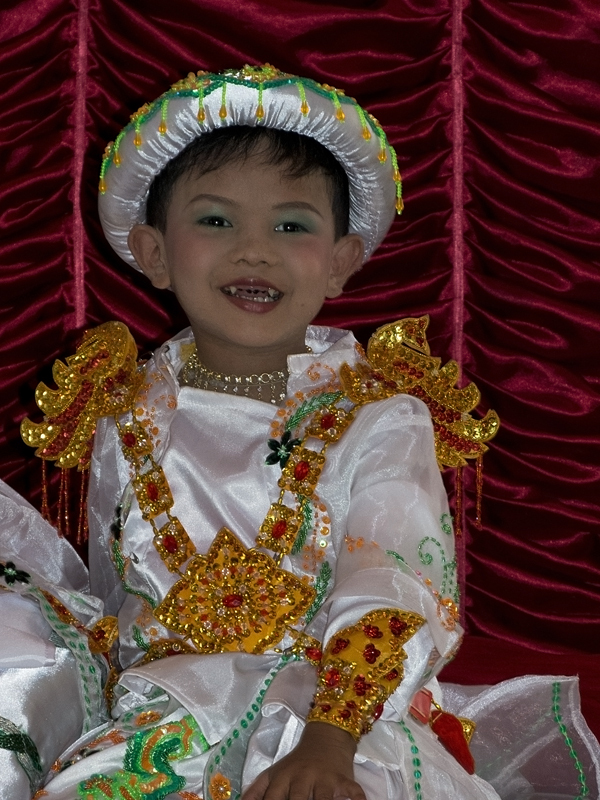 This is what we gleaned – they are dressed as kings, or princes, for the day, and there is much family feasting, with many families joining together, and by the end of the day the boys will have their heads shaved and will enter the monastery. We were invited to join in the feasting but were short of time. 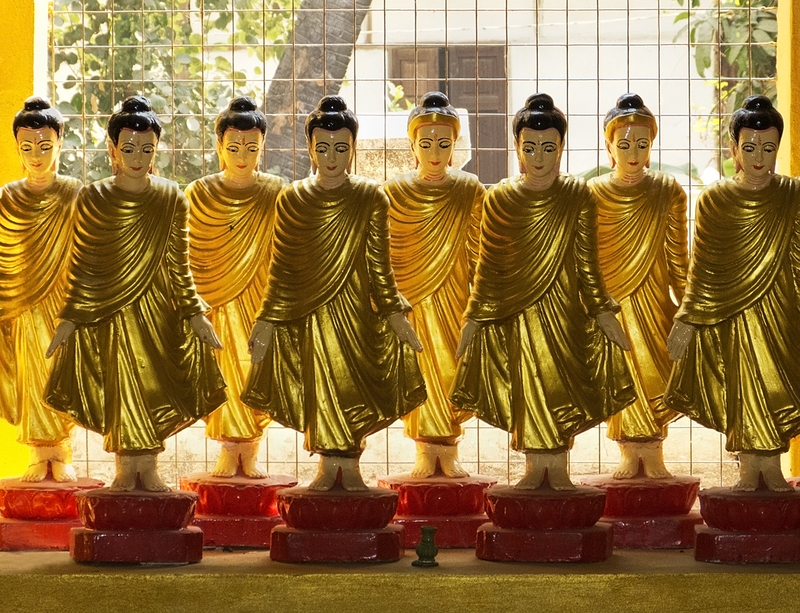 The boys, about seven or so of them, were happy enough to be photographed, and their parents were very proud. 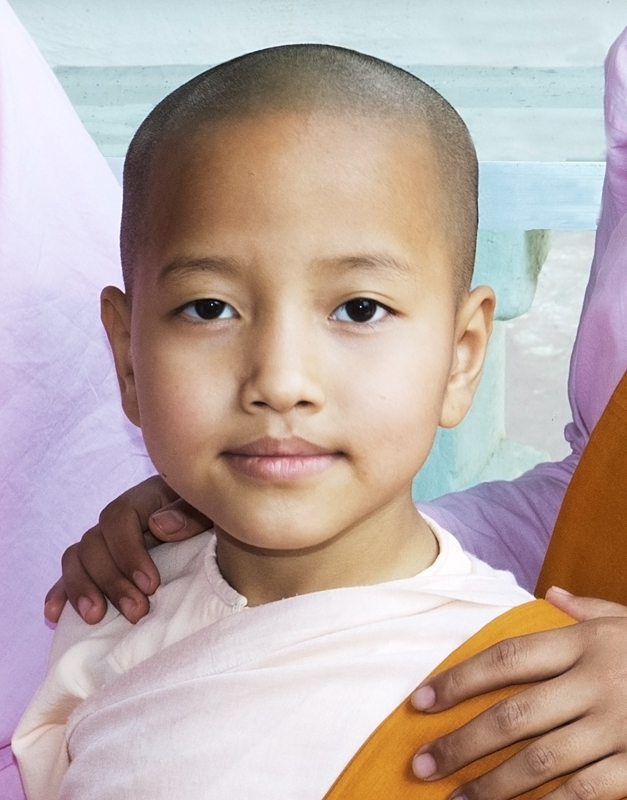 Apparently all boys enter the monastery at some point, some while very young. They may only stay for a few days, or a week or two, or maybe a bit longer, and then return to normal life, but all do spend some time in the monastery. And of course there are those that stay there, or return later and stay. And then we were taken to the most amazing place. Our driver said tourists are not usually taken there. I don’t know why. It was quite fabulous. 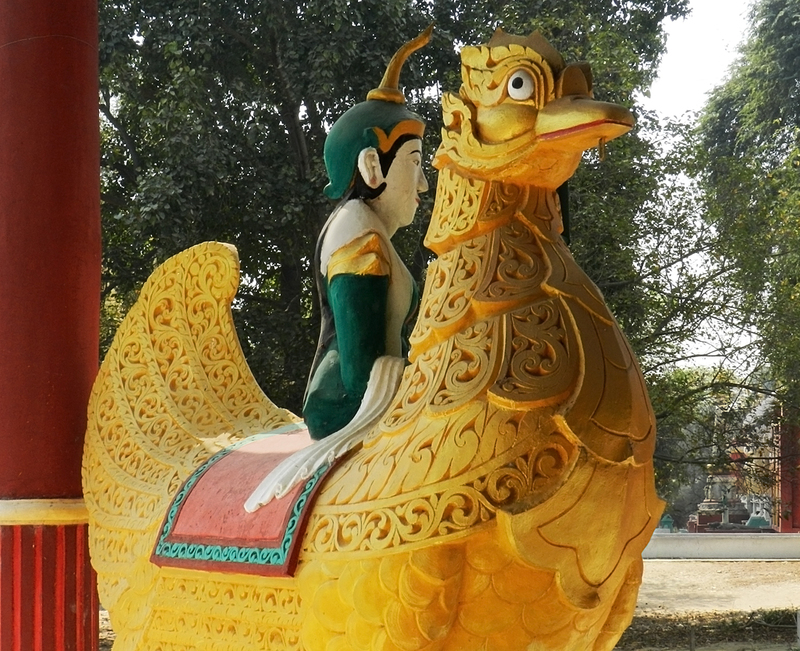 I don’t know where it is, other than in the Amarapura area, and I don’t know what it’s called, and I can’t find anything about it on the internet. The interior space was vast, airy, silent, with many nooks and crannies, and every corner you turned the theme continued, but with more and different statues and places for worship. It was so golden! And empty. But not uncared for. 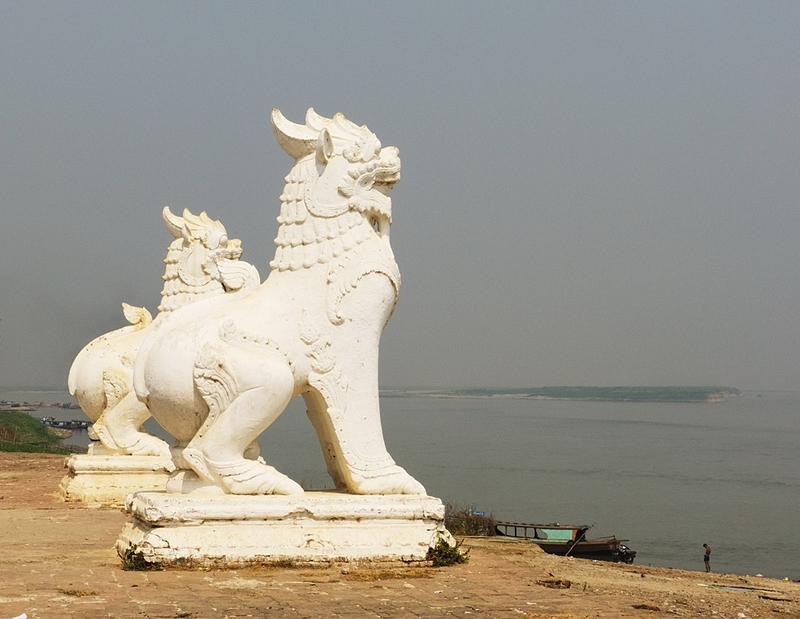 The next post: Sagaing, Inwa and the U Pain bridge. 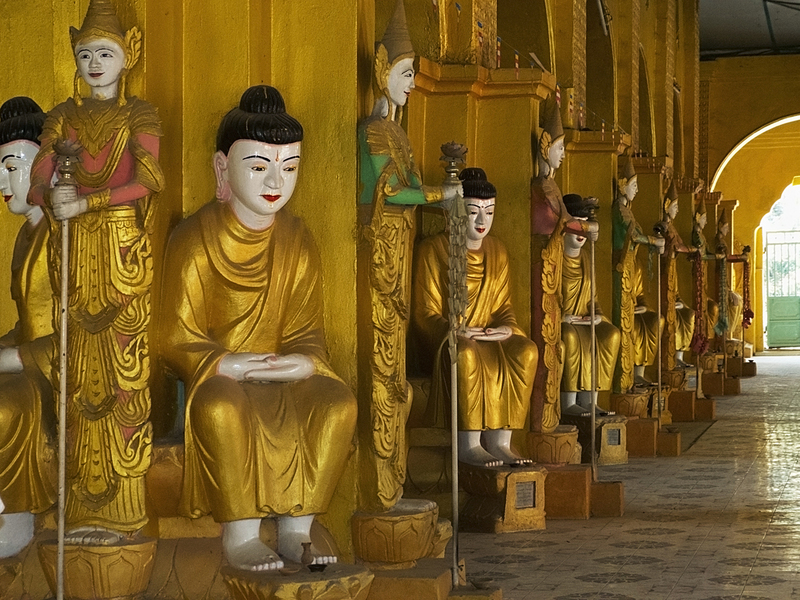 More golden temples, ancient ruins, a horse and buggy through the countryside, and a 1.5km long teak bridge. © Alison Louise Armstrong and Adventures in Wonderland – not just a travel blog, 2010-2013. Wow, I had never heard of this place, but now I want to go! Those pictures are so amazing! Thanks Fiona. 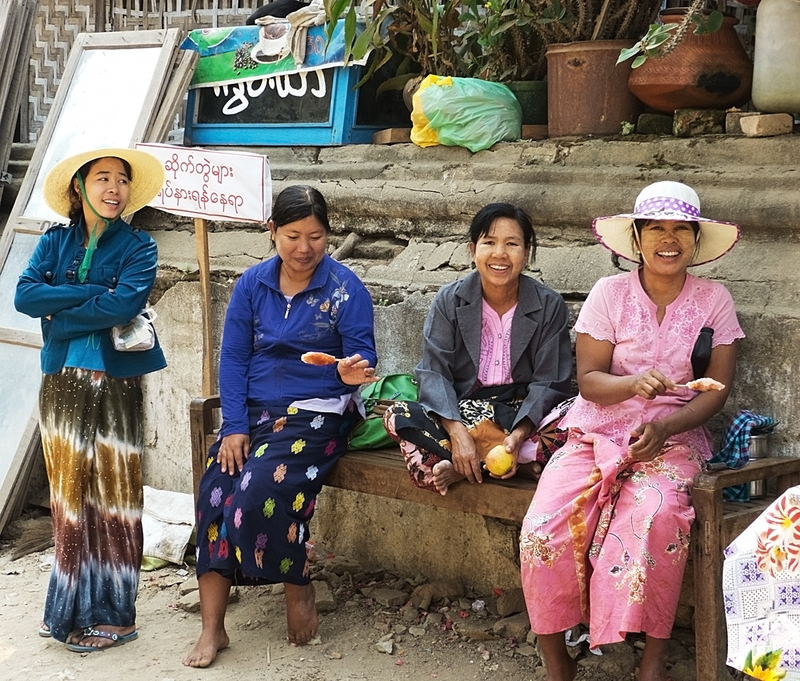 We’d never heard of it either until we got to looking into what to do/see in/near Mandalay. All of it was amazing. Go! This wasn’t even the best of Burma! Thanks Jo. Glad you enjoyed it. 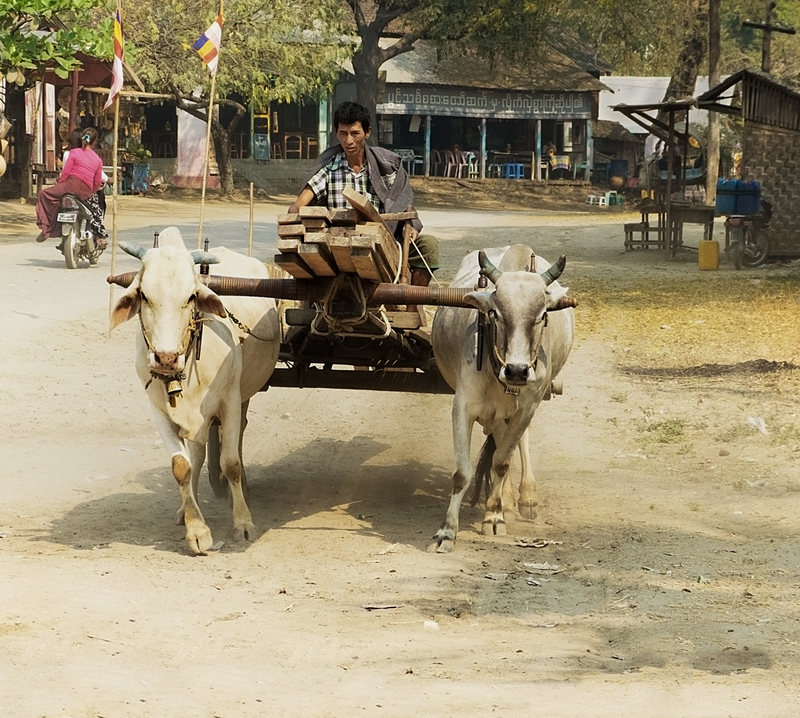 We saw so much that’s beautiful in Burma. Again, your photographs are so vivid, so clear – amazing! I was surprised to see “spoons” as opposed to chopsticks at their dining table. Maybe that’s not part of this culture’s tradition. Thank you so much Laurie. I hadn’t even noticed the lack of chopsticks in that photo! And yes they do use them in Burma. We saw them frequently. I love the way you combine the story of your adventures with the history and fun facts about what we are seeing. Your photos are really amazing. Thanks Naomi. I must admit I do a lot of the research after the fact. I’m sure we read the signs posted on the sites we visited but we didn’t make note of them, and then months later I start going through my photos wondering what’s what. It’s almost as if I find out about a place after we’ve been there – and then it makes me want to go back and have another look! Thanks Liz. Okay, now I know a metric ton is a bit less than a regular ton – multiplied by 90 that’s quite a bit. Another wonderful travelogue or a place I’m sure I will never see first hand. Thanks for the beautiful photos and narration. Thanks Angie, and you’re welcome. Glad you enjoyed it. Happy to have you travelling along with us 🙂 good to hear you enjoyed the trip! I love how you stumble upon these celebrations. Very interesting what you said about all boys entering the monastery. It reminds me of the Dalai Lama’s quote about peace in one generation if we taught all 8 year olds how to meditate. Hi Kozo – yes, the stumbling into celebrations – it continues to amaze us. So lucky. 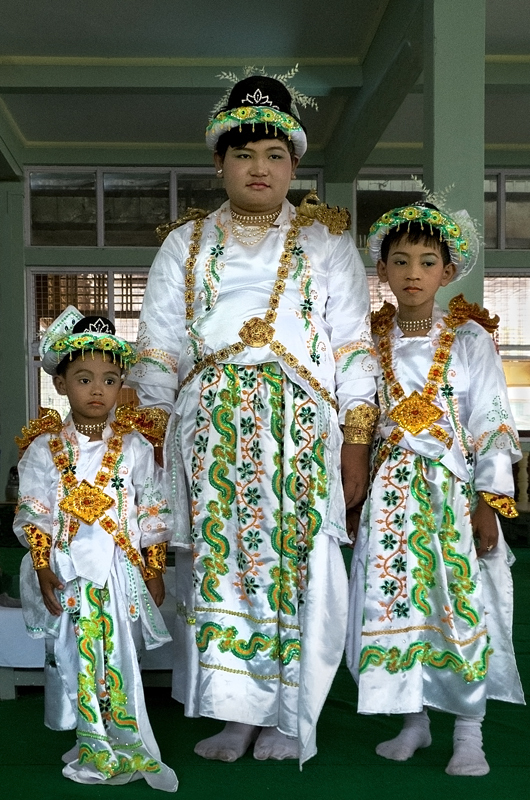 We stumbled into the same celebration in a village near Bagan – I’ll write about in an upcoming post – there must have been 20 or 30 boys, all dressed up, all on horseback! And a bunch of girls going to a nunnery riding in bullock carts. I love what the Dalai Lama said – that sure would bring about some change. I think it was a blessing from the nun – I felt blessed that’s for sure. Thanks Curt. That rooster is fantastic isn’t it! You two just moved I think? No wonder you’re short of time. Hope it all goes well for you. Have fun in AK – how fabulous. Say hi to Skagway for me if you’ll be there. Good luck and good focus with the book, and good fun! Everyone looks so happy. You walk around the centre of any UK city and you won’t see one smiling face. I make them smile with my camera 🙂 It is a game I enjoy very much. My camera is slow so often they smile after the fact, so then I have to tease them to get them to smile again. Or sometimes it all just comes together by itself. Sometimes they get very serious and pose as in the 3 young boys dressed as kings and the nuns under the bell. People do generally seem to be happy, even the very poor.